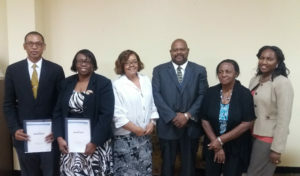 following position at the Nursing Council of Jamaica. and acts for the Registrar in her absence. Dr. Leila McWhinney – Dehaney, Chairman, Nursing Council of Jamaica and Mr. Errol Malcolm Vice President, Finance, Facilities Planning and Management, Northern Caribbean University sign contract between the Council and the Aeorion Software Development Unit, Northern Caribbean University. (HEART) in conducting its first workshop on Competency Based Curriculum. Since 2013 NCJ has been working with the IUC on the challenges it has been having in complying with the student teacher ratio and the ability to provide suitably qualified persons to deliver the nursing programme.